Fine Arts teacher Stephen Hall has been selected as a finalist in the Dobell Prize for Drawing, which is currently on exhibition at the Art Gallery of NSW. 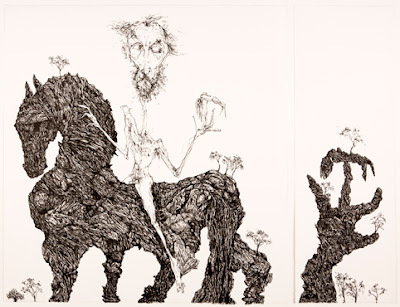 The Dobell Prize is one of Australia's most prestigious drawing prizes, and has a long and well-respected history. Congratulations to Stephen on his inclusion in the Prize. Stephen has also been included in the Dobell in several previous years. If you haven't had a chance to see the show yet, hurry, it closes on Feb 5, 2012. Read more on the AGNSW website here. A Quixotic image.But now for some Authenticism.